CNC'd from Delrin. Replaces factory rubber bushings on the transmission with solid bushings for a more direct and crisp shift. 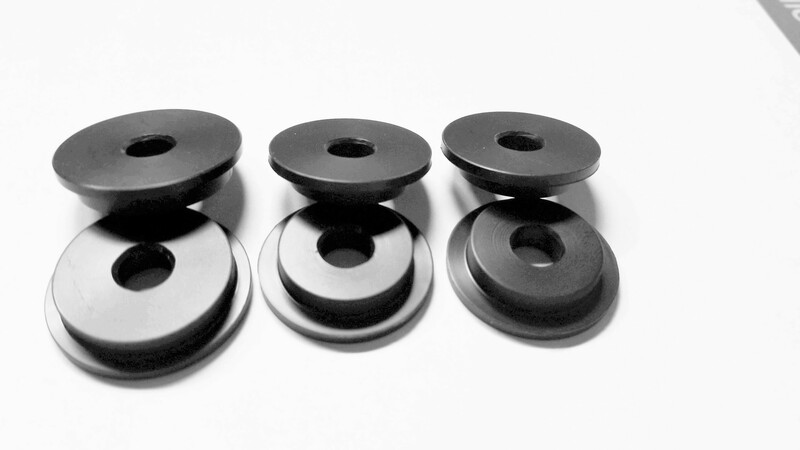 Includes Interior and Transmission Bushings (6 pieces). Optional Billet Aluminum Short Shifter can be added as a combo for 30% shorter shifts. ATTEN: CHECK THE PRODUCTION DATE OF YOUR SENTA. IF ITS AN 04 MODEL PLEASE MEASURE YOUR BUSHINGS. If both the bushings on the transmission are the SAME SIZE 1.1" (outside diameter), then choose 02-03. If the top transmission bushing is larger than the lower bushing 1.4" and 1.1" respectively, then choose the 04-06. ATTEN: CHECK THE PRODUCTION DATE OF YOUR SPEC. IF ITS AN 04 MODEL WITH AN AUGUST 2003 AND EARLIER PRODUCTION DATE, CHOOSE THE 02-03 BUSHINGS. CHECK THE WHITE TAG ON YOUR DRIVERSIDER DOOR FRAME PILLAR FOR THE PRODUCTION DATE.